Here is another documentary series to add to your watch list. This story takes place in the early-to-mid 1980s. I remember hearing about it in the media. My take at the time was that this was another one of those crazy cults with a crazy leader and even crazier followers. That was how the media reported the story. But as is usually the case, the media is more interested in cute sounding sound bites and short two minute clips that they can put on the evening news as opposed to any in depth coverage. The real story was much more complicated. I have been a fan of documentary series ever since Making a Murderer. I listed some of my favorite docudrama and documentary series in my Everything Nonfiction docudrama and documentary series guide. These six to eight hour series allow for an in depth look at a subject. Ken Burns has made a living at creating documentary series. 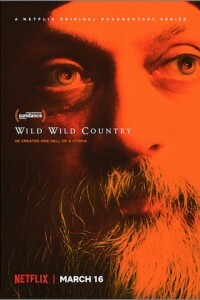 Wild Wild Country explores a fascinating story with many twists and turns. Using recent interviews interspersed with archival footage, the filmmakers tell the story of Indian Guru Bhagwan Shree Rajneesh and his attempt to create a utopian society in Oregon. The story is told mostly through several key players: Bhaqwan’s personal secretary Sheela, his personal lawyer Phillip Toelkes, and several of Bhagwan’s followers. It starts off innocent enough. The goal is to create the ideal community. Once Sheela is given the go ahead to find a place where the Bhaqwan can expand, she sets out to find the ideal spot. She settles on 80,000 acres of undeveloped ranch land in Oregon. Here she begins to develop the ideal community with what seems like an unlimited amount of funds. As the community grows and more and more people begin travelling to this new city in the mountains, the locals become bitter. They don’t like these people who they see as invaders. They hate what they don’t understand. There is resentment. There are efforts to stop them at any cost before they take over their tiny community. The filmmakers do a good job of showing all sides of this conflict. On the one hand you root for Sheela and her attempts to create Utopia. But once Sheela is pushed into a corner, she fights back and little by little she exerts more pressure and her methods eventually turn criminal. The locals and politicians who at first come across as ignorant and unjustified eventually gain the upper hand. Before it is all said and done the whole thing collapses almost as fast as it all started. This series is worth your time. See it.